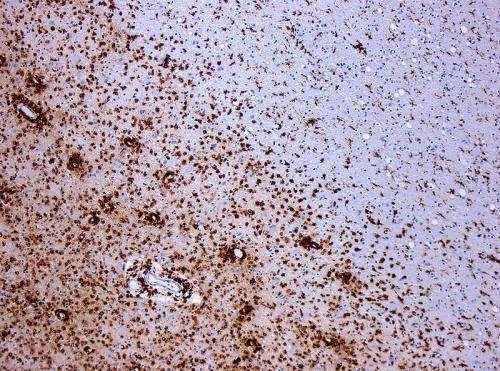 Study implicates new gene in MS disease activity. A new study led by investigators at Brigham and Women's Hospital (BWH) reports the discovery of a genetic variant that is associated with a patient's likelihood of responding to interferon-beta, one of the medications used in treating multiple sclerosis (MS). Published in the Annals of Neurology on May 14, the study also presents evidence that the affected gene, SLC9A9, may have a broader role in regulating the development and activity of certain immune cells that play important roles in inflammatory diseases like MS.
A proportion of MS patients experience disease activity despite treatment. The early identification of the most effective drug for a given individual is critical to impact long-term outcome and to move toward a personalized treatment approach. To find predictive indicators of a patient's response to treatment, the team, which included researchers from the Ospedale San Raffaele in Milan, Italy, performed a genome-wide association study (GWAS) in MS patients from Brigham and Women's Hospital, San Raffaele Hospital and seven academic MS centers in France, all of whom were being treated with the drug interferon-beta. The variant most predictive of whether or not a patient would respond to the drug was found in the gene SLC9A9. "This study highlights the fact that genetic variation has a role in the course of a patient's disease in MS, but that this role is modest and will require much larger studies to be understood in detail," said Philip De Jager, MD, PhD, who directs the Program in Translational NeuroPsychiatric Genomics at the Ann Romney Center for Neurologic Diseases at BWH. "We need to expand this type of international, collaborative science." Discovered in Italian patients, the observation was replicated in other Italian patients as well as patients in Boston and patients in France. "Further work is now needed to validate our results in other collections of patients, particularly patients treated with other MS medications, to evaluate whether the effect of the genetic variant is limited to interferon beta treatment or is relevant to other clinical MS treatments," said Filippo Martinelli-Boneschi, MD, PhD, of San Raffaele Scientific Institute. The variant detected has a confirmed but weak role in MS. However, laboratory work in this report shows that the loss of the SLC9A9 gene leads immune cells to become much more likely to provoke damaging immune reactions. "Manipulations of this gene in mice and in human cells will lead us to better understand mechanisms that are involved in the autoimmune response that causes MS," said Wassim Elyaman, PhD, an investigator in the Program in Translational NeuroPsychiatric Genomics at the Ann Romney Center for Neurologic Diseases at BWH.